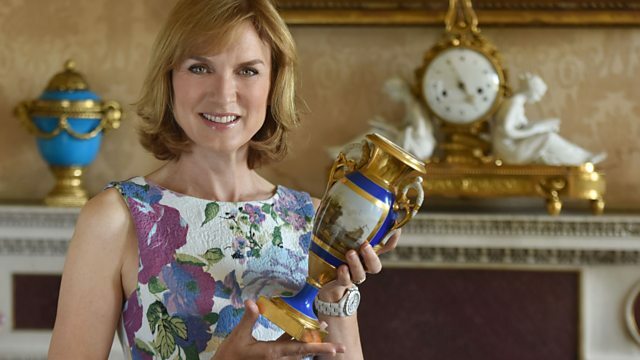 A return visit to the gardens of Arley Hall in Cheshire with Fiona Bruce and the experts. Finds include a portrait of a visitor's mother painted in India in the 1950s. Browse content similar to Arley Hall 2. Check below for episodes and series from the same categories and more! because this is one of the oldest country gardens in existence. is one of the oldest in the country. Look at it - isn't it glorious? as being at the heart of this home. that it is Grade II listed. The garden is best known for its fabulous herbaceous border. the earliest plan for a herbaceous border ever found. who painted these watercolours in the 1880s and '90s. "or in any way better done than those at Arley in Cheshire. "how happily mated are formality and freedom." on this week's Antiques Roadshow. We don't get many nuns brought into the Roadshow, funnily enough. And here she is, a beautiful porcelain nun. I bought her a few years ago in Braderie de Lille, in France. I just loved her when I bought her, so I've had her ever since. it's like a piece of sculpture. A piece of sculpture in porcelain, and it's beautifully painted. that's actually hand-painted. These tiny little scrolls. it's difficult to show it, but can you see there? -There's an inscription in the Bible. which is from the Latin version of the King James Bible. -So she's a nun and she's reading the Bible. there's no "Made in France" or factory mark or anything. -So how on earth would you know what she was? -I do, that's the good news! I do, because I recognise the kind of porcelain that she's made from. it's a particular tone of colour, of gilding. I even recognise this blue that her Bible is bound with. and that factory is not in France. -It's in the East End of London. -So she's a Cockney nun. -she was made 1758, 1760. ..of English porcelain by one of the best makers there is. -How much did she cost you? It's worth a minimum of 350 to 400.
in any Victorian parlour, aren't they? But the eyes rather follow you around the room. You can sort of tell once you know that they are. -Your eyes are blue, though. -My family do have very blue eyes. That will be, they've brought them out. blown up and then painted over to make these. you can see it's exactly the same pose, can't you? and made her look as though she's living and breathing, haven't they? And the same with him. and then he himself has been spruced up no end. His moustache looks rather splendid. Tell me, why did they bother to have these rather grand portraits made? We're not sure why they had them made, but he did die the year after. to force the pit owners to insulate the wiring systems. -So this is down the mines? -And the wires were uninsulated? Initially they were uninsulated, and people were dying because of it. you're probably not wearing a shirt and it's pitch dark. You bump into something and give yourself 240 volts. No wonder it was dangerous! and he said the pit owners said it was too expensive. Well, there you go - money, money, money. And so how did he manage to get that done? because although he wasn't a lawyer, he was well-versed in law. And he provided the funds for her to bring the case. they had to insulate the wires, and that was passed throughout England. to be able to represent this widow? prior to the welfare state. in dire need, they were supported from the fund. From the fund, I see. -You've got the medal with you. -Yes, I have got the medal with me. It says "with thanks for services rendered" on the back. -And it's from the Foresters? -for this kind of work. who were mourning his loss. that you might just skip over occasionally? because he did so much for the community. -and I don't suppose you expected them to be, did you? he seems to me a very important man in the early trade union movement. and so that makes it important, in that sense. I'm going to put £500 on the pair. -So a total of £1,000. They're very precious, we'd never, ever sell them. I wouldn't either, if they were mine. Cockerels. You see them in nearly every continent in the world. Where do you think this cockerel was made? and he is extremely heavy. -and all that cast metal, all the foundries? Well, certainly from a foundry, but not in Britain. -In fact, he is absolutely, definitely Austrian. and the most well-known is the Bergman bronze foundry. who was another Franz, around 1900.
the castings remained the same. so it's quite difficult to tell exactly when he was made. that has been painted over. It's a two-handled urn with a capital B. That confirms what I already feel about it. Who did he belong to? He belonged to my uncle Harry, who was 20 years older than my father. And so did you know this as a child? he's died and he's come down to the rest of the family. He just keeps on moving on, don't you? because a lot of these bronzes get very scratched over the years. The glass eyes are perfectly intact and he's very colourful, isn't he? Yes, he's very smart, isn't he? -but that's when they are this size. -and on a great scale. Ooh, that's nice. That's a surprise. Oh, well, you were worth lugging around! but it can also be a little bit about scandal. Who would have thought it with a beautiful bracelet like this? Tell me about the history. she wasn't held to be his wife. It was a secret marriage. This was when he was trying to persuade her to come back to him. We're talking George IV here, aren't we? -He eventually became George IV. to come back to him in about 1799. So how did the bracelet come into your family? and probably was given to my great-great-great-grandmother. who of course was Prince Regent to start with. He had quite a complicated love life, really, didn't he? -I think that's the best way of putting it! it was never going to be, was it? It's such a shame. The bracelet itself is made of gold. That is supposedly a clue to its provenance. "Let's get back together," "Let's get reunited or I'll die." in the first place, there was a mock stabbing. to try and persuade her to marry him. So this is possibly a link back to that first occasion. It just shows the passion that you can have for somebody. So, that's the inscription there. and then a little turquoise in the middle there. because it's supposed to be the true colour of the forget-me-not flower. green colour which is its original colour. and then reverts back over time to the green. there is a little locket on the back. a very, very daintily painted little eye. It's also got an inscription on the inside of the locket as well. That says "mirror of my heart". Oh, it just gets so fabulous, doesn't it, as we go through? it's an absolutely gorgeous piece of jewellery. you would be looking at an estimate of £2,500 to £3,000. because everybody does really love a little bit of scandal. and you've made it your own. -So, tell us about it in your life. that had been in the school for a long time. One of the things was a first aid kit, and that was in it. It's lovely, isn't it? A lovely colour. that I've got at home and can I have that? So I had it and then I've just collected them ever since, really. -How long ago is that? -Oh, 20 years, a bit more. -Do we have your entire collection here? OK. They were in everybody's home, weren't they? We all had one when we were kids. And you'd put it there and then she would tell you to blink. -It was warm water, you didn't have to buy some product or anything. -Bit of salt in there. Warm water and salt. I go round antique fairs, and it gives you an excuse. but you can be in an antique fair and get something. in a junk shop or something and I sort of acquire them, really. They are, funnily enough, an extremely collected area. Don't feel as if you are alone in the world of this bonkers mission. because it says "British made,"
I think they're probably Polish! and they really are... I've kind of grouped them. Your best ones are here and some of these are approaching 100 years old. So, I think that you were paying about three quid for these. because I think these are sort of 20 quid each. One like that has got to be 30 or 40 quid. and being badly made. It's brilliant, I love it. I love badly made stuff. and here you've got the cream. What you need to aspire to is that level there. And it's fun doing this, isn't it? they have to buy me more expensive ones! mobile phone shops, estate agents and tanning shops. But what happens if you're in the 1930s and you wanted to tan at home? You get, of course, the Vi-Tan home tanning machine. Why on earth do you have this rather scary-looking device? It is quite terrifying, isn't it? it was one of the things I inherited from him. had a home tanning machine. Was he some kind of bronzed Adonis therefore? He was a man of means, I think. He had his own aeroplane. He had a Sopwith Pup. of the Broons cartoon in the Sunday Post. They're the Scottish cartoon characters? There the Scottish cartoon characters, that's right. at the character in the cartoon, it's very much like Grandad. little bristle moustache and quite the man of the house. very long time and got a good tan! it was made by the Thermal Syndicate Limited. something you plugged into the electrical socket and you stood in front of it. I just love the label on the back here. "Always wear the goggles provided when near the lamp. "Normal initial exposure, three minutes at three feet. "No effect will be felt for three or four hours. "Under exposure is better than over exposure." I mean, it's kind of terrifying, isn't it? you mentioned he was a man of means and he would have had to have been. I think somewhere in the region of £30 to £50 as a curiosity. Yes, well, it certainly is very curious. -You wouldn't want to plug it in, would you? Please get it looked at before. You know what? I don't think I would want to stand in front of it either. or a nice holiday in the Costa Del Sol? Come on! We know the answer, don't we? Fantastic, thank you very much. showing that a man was in Burma. daily from the 15th of February until September 1945 when he was released. and the stories that we all know from that magnificent film. and 67,000 or 70,000 died. just saying it was a good day or a bad day. There's no drama in it, it's not dramatic. Like these terrible people and these terrible tortures. bowl of water you can't reach and things like that. the camaraderie to help each other through. Did he ever tell you how he kept it? -How did he keep it? -Where did he get the ink from? they could use for other purposes. There is this moment here where the ink probably ran out and they moved to a pencil. What is the significance of this moment? with 28 or 30 people per carriage. They were unable to sit down. Singapore to Ban Pong which was west of Bangkok and the beginning of the railway. How long did he work on the railway for? Seven months. The railway only took one year to build. They say a person died per railway sleeper and it was 215km long. to get back to normal health. It is such a unique record. I've really ever seen a diary written like this. that you've been out to Thailand and Burma to see where they are buried now. It's almost impossible to put a price on this. bless him, he probably had nothing? A bowl of rice to him was worth the earth. it would actually really wouldn't realise what it would be worth. It would probably be £600 or £700. there is no price that you could put on this. to staying alive is recorded here. and here are you and I am wondering why you collected three copies. there are always fundraising things going on. "I've bought a copy of Where the Wild Things Are,"
which she was very pleased about. She said, "and it's a first edition." I said, "Let's have a look." I turned the page over and said, "Do you know it's signed?" So, how much did you pay for it? Let's just have a look at this. 25 cents and you say it's a first edition. -Well, let's just look inside. Yes. And this is the signature here. Maurice Sendak. To Jeffrey and Emily. -is it's lacking a dust wrapper. Which is a great shame, yes. But about these other two? You've got one here in Welsh? of Where the Wild Things Are that came along. In the local flea market, that's where the Welsh edition turned up. -The third one was a car-boot sale. It's the 25th anniversary edition. so we've got a lot to go at if we can get a first edition of every one? We've got four grandchildren so we definitely need another one. So you're going to give one to one, one to another, one to another? It would be a lucky dip, I think! Right, let's start off with prices, shall be? it's not going to be terribly valuable but I imagine £20 or £30. The first Welsh edition, probably a similar amount of money. It does have a dust wrapper but the condition is not terribly good. Now, you're going to break up the family if you start distributing that, aren't you? it's an absolutely wonderful story to read to the grandchildren. I couldn't help noticing your potty, sir. Are you worried about the length of the queue? -In case you get caught short? Where did you come by this marvellous potty? I will go and see them off before they go. They said to him, "Do you want this pot?" He said, "Yes, I'll have that, that's lovely." And that's how I've come to get it. "fill the flowing bowl" which is a drinking song, isn't it? I think it is, yes, but it's changed, hasn't it, to fill this. Clearly. Oh, look, it's got "patent non-splash thunder bowl". you won't be waiting so long you'll find yourself in need of using it! -Is it yours or a family thing? of clocks and watches that he had accumulated. but he always said this was his favourite clock. The story is that it was either the clock or a family holiday and he went for the clock! Where was the holiday to? and screamed so it was probably a wise choice. but let me just tell you that it's English through and through. Mid-19th century, sort of 1850, possibly 1855. It's everything that the English clock collectors want. The wood is satin wood. Two winding squares, one for going, one for striking. subsidiary seconds at the 12 o'clock position. don't you? This doesn't have a pendulum. It has the most fantastic giant platform. Lovely. Let's look at this dial. Beautifully engraved, lovely fleur-de-lis hands. It is a really nice dial. The only thing I can fault on it, there's no signature. for the back of the platform. Size is not too big. I don't know why it is not signed. We will never know, but it is anonymous. I suppose that holds it back a bit. So, what would be your chosen holiday now? I think I'd go for Honolulu. -I've never been to the South Seas. So, what's that going to be for two of you? How do you think it equates? Well, I think I'd rather keep the clock than go to Honolulu. if you were to sell it at auction, would make a minimum of £15,000. ..that it was a very good decision to have made initially by your father. He made a lot of good decisions, so, he's done it again. But that is the case today. You've brought this along on your barrow. This is a beautifully made piece of stained glass, I really must say. Tell us how it fits in your life. paid the man, and I have had it for 13 years. This is the inside and this is the outside. This is where the oak is. I would think it's somewhere about 1880.
and what you're going to use it for. You've got to have a very specific place for it. I notice you haven't done anything with it. It's just sat in your garage for the last 13 years, hasn't it? Well, I've been waiting for planning permission for my extension! -To do an extension to our house. -Oh, you're going to use it? Oh, brilliant. Look, I tell you. -you've done all right, mate! You might think you're looking at a portrait by a European artist of the 1930s. was done by an Indian artist in the 1950s. Can you tell me something about the sitter? Yes, the sitter is my mother. That's how he came to paint your mother? -Well, the artist has actually signed his name. A very well-known artist in India today, Krishen Khanna. -or you had a family relationship with him? and Pakistan, they moved to Shimla, where he worked in Grindlays Bank. and he becomes a professional painter. from the '60s, '70s, '80s etc. It's extremely rare to find a picture by Krishen Khanna from 1954.
all of these names that have now really achieved celebrity globally. It's very, very much rooted in the European painting of the 1930s. who want to reclaim some of this modern heritage and who have started to collect. Do you have any idea of the value of a 1954 Krishen Khanna painting? It has never been valued. "Go ahead, see what happens." -Are you shocked, or am I? I think you're going to make her a very happy lady today. ladies don't do so much lunch as they are doing afternoon tea. Absolutely. I'm having afternoon tea on Sunday. Oh, are you? Are you using your best china, that's what I want to know? -Where has it all come from? and I believe it was her great-grandmother's wedding set. It must have been around about 1830 something like that. Right, OK. You know full well who made this? -Because on the base of this saucer, we have a mark. That is a mark of the Rockingham porcelain factory. The mark there is the puce mark, and that mark was used from 1830 to 1832. -So that would tally in absolutely perfect. -What strikes me is the quality of the flower painting. I mean, let's just take this one cup. Everything you see on there has been painted by hand. But what an expert hand. Now, this is just a selection of about how many pieces? -Well, it's a high-risk area. and it's been a bit of a downward trend when it comes to price. nearer £1,500 - £2,000 today. that is the ultimate tribute. living in America and a friend of mine's aunt passed away and I helped clear out her estate. do the bull work of clearing everything out. So you obviously love it as much as I do. It's made and designed by Homer Gunn, who is a recognised artist in America. He did a lot of monuments. He studied in the Rhode Island School of design and art, 1938 - 41.
to become the sculptor that he actually was. as if it is jumped together almost out of a tube into life. You must have loved it to bring it back from America. I do, I love the fluidity of movement in it. -Just two lines of brass. -And a little bronze mop on it. and it's even got a bit of movement in the curve of its spine. And when we look at it around here, its body is just two circles. And its tail is even floating away this way. It looks as if it's going to just jump over a fence and float away. He was an important designer in several art circles in America. The Boettcher six were one that springs to mind. And he actually did several big monuments. but this works in a small and simple and acute style. we can see it's signed, or inscribed, Homer Gunn '65. And it is very typical of the period of the brutalist modernist period. These are the antiques of the future. These are the things which are making the money now. but those that do command some good prices. is now going to be worth £1,500. -Thanks for bringing it to England because I love it. like a duck's foot. Sort of. And it was made in about 1770.
to intimidate large groups of people. They are rare, rare things. There's huge amounts of fakes. certain that this is not one of them. Oh, well that's very nice to know. Very nice to know. -I bought it in a shop in Pudsey. they had an antique section. And I popped in one day. He brought one out, he brought that out, and I said, I'll have it! So it was a bit of an impulse buy then. -Well, I think it was a very good impulse. And, if we just look at it, you can see on the side, the maker's name. He was the man who made it in the 1770s. If you had two of these, the crew is not going to try and storm you. You can say, "Right, you lot, back below decks." which gave you five or six shots. That gave you four automatically. no crowd would want to have a go at anybody armed with that. you'd be paying something like £3,500 for it. So, quite a lot of money. And it's a fantastically good thing. It's been just great to see it here today. -Nobody will argue with that, will they? Thank you very much. No, they won't. I like to think this is the young Mary Berry. Actually, the date is 1942. Now, how do I know that? Luckily for me, there's a label on the back. and, on the label, it says "ICI". for a chemicals company to have a label on the back of a painting. of women working on the Home Front. This is called The Kitchen Front. It's on the label. So, it's a wartime propaganda poster, really. It was made as a poster, and this is the original painting. you hadn't looked at the label, had you? I'd seen the ICI part and I wondered what the connection was with ICI. So, you didn't know who she was, Doris Zinkeiser? She was one of two sisters. Doris and Anna. and they both painted quite similarly. But Doris, in my opinion, is the better painter. she worked for the London Theatre doing set design and costume design. Raised her up to a much higher level than just that. its simplicity and the stylised forms. -And it's modernity, for 1942.
why did you buy it at all? and I just love the simplicity. I like the lines of it and the naivety, really. It's got a wonderful light to it, and an innocence as well. -It is, I think, a really sunny, lovely picture. Now, what did you pay for it in that auction 20 years ago? It was a few hundred. I honestly can't remember, but it was a few hundred. In fact, they are very valuable things. because it's a wartime thing and it means something. She's trying to put a message across. But, nonetheless, I can't put it at the 20-30,000 that they are. I'm going to put £2-3,00 on this one. Yeah. I honestly didn't expect that, no. of Martin Brothers for me. But how's it come in to your possession? which has just always been in the family. about the time it was made and produced. So, we're talking about the beginning of the 20th century, are we? -So was he a man of means? to be able to buy such things. to the premises where they used to retail the wares. But look at it, What a fantastic piece of work for them. Beautifully pottered. This is all characteristic. We do have one slight issue, do we not? We certainly do. Yes. Yes. is now a rather stunning and spectacular...damaged vase. and I was told that it was damaged by a bomb. Was this the only one that met with damage? That's the only one that was damaged. to have only one and the rest survive is no bad thing. But it is a shame, and obviously, it IS going to impact on it. somewhere in the region of £8,000-10,000. Oh, wow! That is just amazing. But what did they cost you? it's worth about £3,000 in today's market. My goodness. But all the damage? I think of very visual and colourful enamel signs like this. So where did you get this sign? -when I was a child. -You bought a few, did you, as a family? Yes, it's been in a collection over the years. -There was about four that we bought while we were on holiday. Yeah. There's about 35, 40 that we've got now. Fantastic. And of course they were originally made for use outside. onto a wall, and, I mean, they do fake them now. and lots of wear and tear. the central beautiful Greek maiden. they've taken an image, really, from a Victorian painting. These do evoke a past age like nothing else. the life of these very expensive signs was soon over. The market for these has really grown. This is a very good example. Super state. I would suspect at auction it's going to make around £2,500. Which would mean it was probably made in the 1920s or '30s. Now, have you had this brooch in your family since the 1920s or '30s? No, I've had it since the '50s. -And she bought it from Robb's the jewellers in Pitlochry. was originally drop earrings for the Seventh Duchess of Atholl. what, seven, eight miles away from Pitlochry? and if you turn it over, there are a pair of clips at the back. -..as a clip on each side of your little jacket. -I've worn it once like that. let's talk about what it's set in. Look at those stones! What fantastic colour they are. -What you know about those? -But I don't know much more. -All right, well, shall I tell you something about them? The best ones in the world come from Colombia. -They are of that genre. Each of the stones weighs over - in my assessment - two carats. So there's probably two carats, two carats...four carats. -Might be a bit more than that, but I'm being a bit careful here. -Everybody likes things like this. What do I think they're worth? What are you going to do with it, now? I'm going to do exactly what I've done with it the past few years. and eventually, my daughter behind me will inherit it. -it's a classy piece and I congratulate you. I wouldn't mind being that daughter who is going to inherit it. Walking around with a £40,000 brooch? Lucky girl! Our day here is drawing to a close. Our crowds are leaving. here at Arley Hall, until next time, bye-bye.